this is not a post about my weight. I’m trying to start calorie counting, again. I think I’ve tried it a dozen or so times before but it can be VERY frustrating. Don’t get all “but you’re so tiny on me…” I’m not trying to lose weight but merely maintain my weight. Now that I’ve started training more, I’ve heard that it’s easy for nutrition go on the back burner. You’re thinking “hey, I just ran 4 miles, I think I’ll eat that second cupcake”. So far, I have been BLESSED with a speedy metabolism and the ability to eat mostly what I wanted. I’m not a huge fan of junk food in general but I could live off cereal and pasta. Not exactly a balanced diet. I want to start creating habits now that will carry on into my 30s and 40s. Habits that I’ll be able to pass on to my kids. My outlook on calorie counting is that it’s simply a way to be mindful of what I’m eating and if I’m getting a balanced diet. Part of being a successful athlete includes how you fuel your body to help you perform better. I signed up for MyPlate with Livestrong because it had come highly recommended. There is an available mobile app that syncs with the website and the interface seems pretty intuitive. Calorie counting gets complicated, however, when you’re not eating a product with published nutritional information. Restaurant meals, fresh fruits/veggies, meals you make combing a variety of ingredients… It can be really tricky to truly know the nutritional value of that meal. What are you tips for calculating those calories? At the end of the day, however, I’m not concerned with 100 calories. I’m hoping that by being mindful of what I put in my mouth (through calorie “estimating”) will translate into a healthier, more balanced diet. 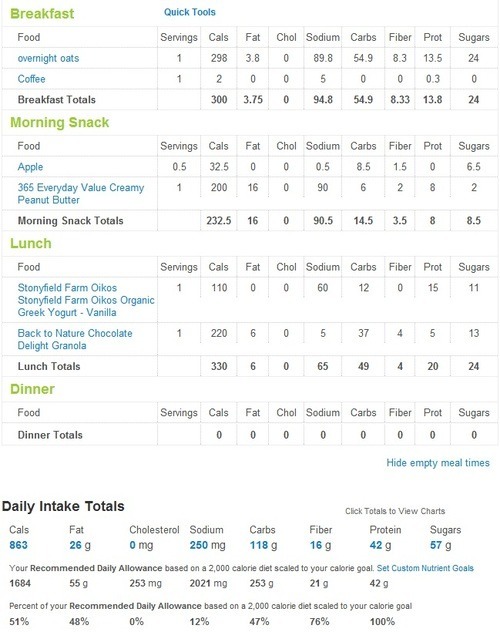 Do you have a favorite site that you use to count calories? Muscle weights more than fat. Something that for a long time, really scared me. I didn’t want to see the number on the scale move. At all. Even if I was more toned and “in shape”. So let’s just get over that number, ladies. Whatever it may be. Everyone needs a different number of calories. There is a base number of calories everyone needs just to exist. Then there are the number of calories you need to live a healthy, active life. You lose weight when you create a deficit in your calorie intake. Meaning, if you consistently ate 1500 calories and burned 700-1000 a day, you’d probably start to lose weight because your body most likely can’t live off of 500 calories. Stay tuned for posts about vitamins, salt, running and maybe even a new energy bar recipe!